Bushido Tactical has been established as a well-known company for the development of unique, quality tactical nylon and other innovative tactical products. – Patented US D730,238S WARSOC™ buckles. 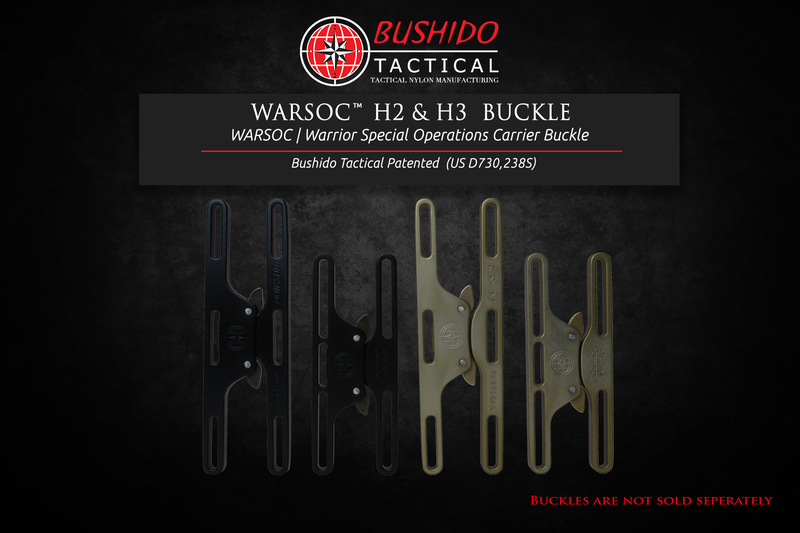 WARSOC™ – (WARSOC | Warrior Special Operations Carrier Buckle) utilizes a locking mechanism designed by Austri Alpin in conjunction with Bushido Tactical’s Patented slim “H” buckle design which was specifically made for body armor and plate carriers. Proprietary to Bushido Tactical’s tactical product line, all of our plate carriers and ITUS tactical vests are permanently attached with the revolutionary, Patented WARSOC™ or WARSOC™ buckle system which provides a faster, yet effortless accelerated deployment option. This alleviates the conventional front cummerbund flap from the front when deploying the PC. This new innovative design allows for the operator to permanently leave the front panel pouches loaded with gear without having to worry about it getting in the way when trying to get out of their vest / carrier.